Up until this weekend, I had never been a huge Mario Batali fan. Not because I had anything against him, but more because I didn’t know much about him. He was a jolly looking red haired guy with an Italian name and a show on the Food Network. He seemed likable enough. After Friday though, I’m ready to submit my application for his fan club. Flaneur and I went to Casa Mono, the Gramercy Spanish-style eatery that Batali is co-owner of, and since then, I’ve become a believer. Big time. Casa Mono is cozy and small, with a cluster of tables packed closely together on the main floor and the rest of the seats lined up around the bar and cooking station. Lucky for us, we were seated right in front of all the action, right where we could see the cooks at work and hear the meat sizzling as it hit the grill. 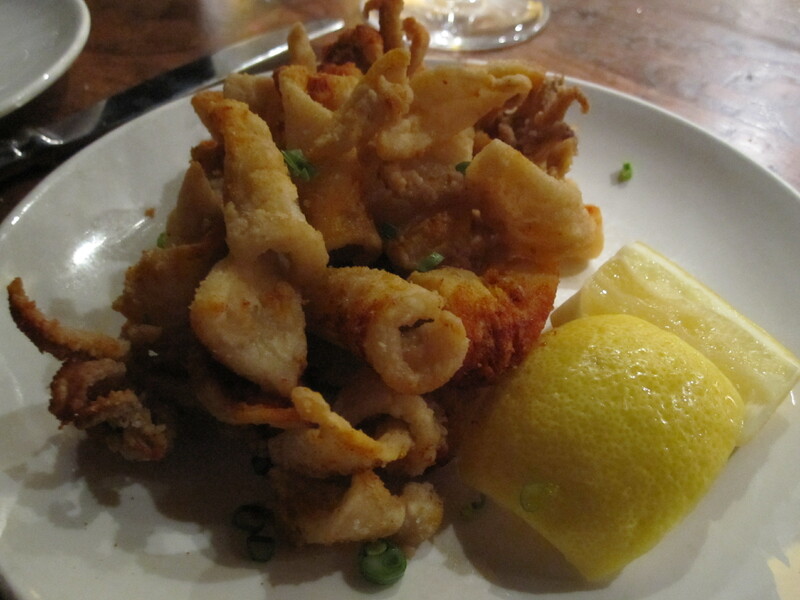 We shared everything, tapas style, but for the first round, I ordered the calamares fritos. They were juicy and tender on the inside with a light, crispy, seasoned fried outside. The salty, tangy seasoning dusted on top went perfectly with a twist of lemon and the subtle taste of the calamari. 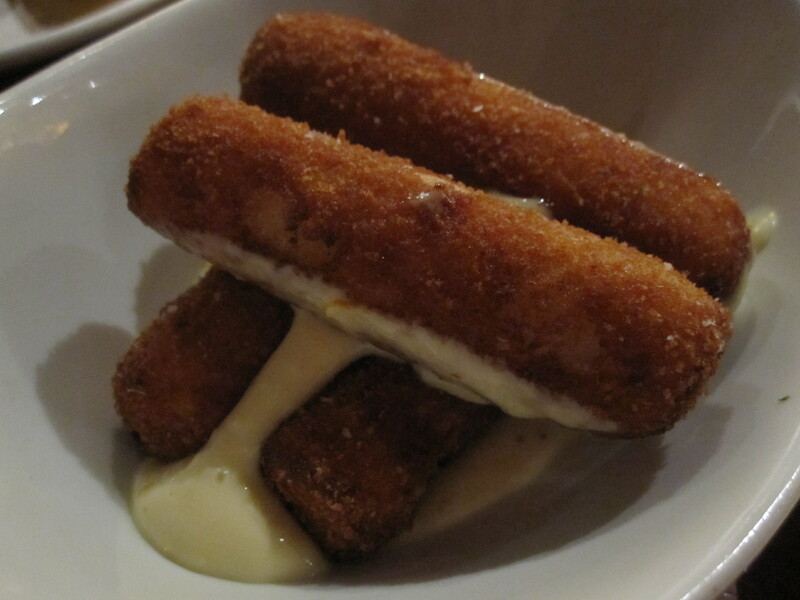 For his first plate, Flaneur ordered the bacalao croquetas with orange aioli. I’ve never been a huge codfish fan (due to a childhood of eating my mom’s cod, which like many things, was just…eh) but the cod used in these croquettes was delicious and creamy, as if it had been pureed before being battered and fried. But the best part of this dish was the orange aioli sauce. Garlic, olive oil and egg usually make up this Spanish sauce but the orange in this one gave it a twist with the bitter zestiness of an orange peel. The calamares had been recommended, but my second dish was a bit harder to choose because everything on the menu sounded so good, and the different plates we could see being prepared on the other side of the short glass partition between us and the cooks looked incredible. But when I saw pork belly, I knew it was the way to go. Crisp, thinly sliced apples were layered over juicy squares of pork belly and all of it was in a vinaigrette-ish salsa jamaica, which was sour and tart, and had the deep color of ripe raspberries. 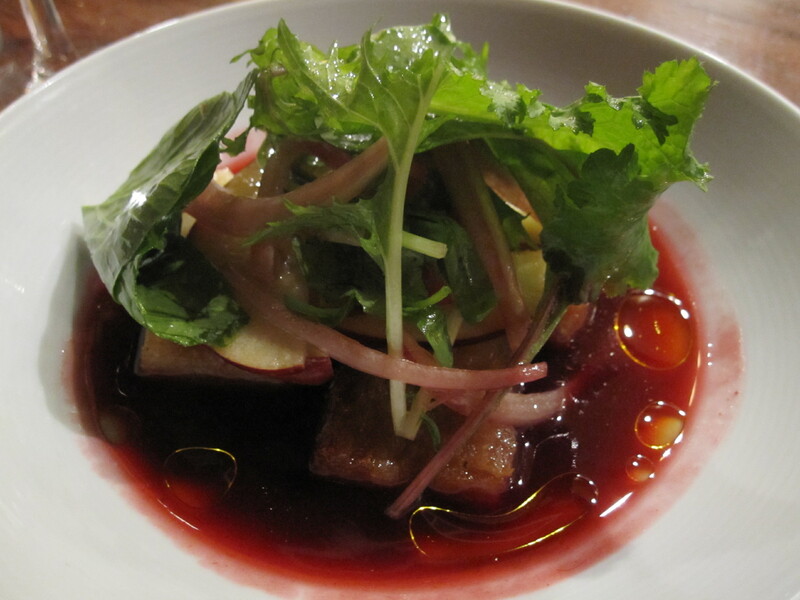 Pork belly with greenmarket apples and salsa jamaica. Tripe is another one of those foods that I’m kind of on the fence about, but Flaneur ordered it and I stood behind him on that. It’s the consistency that irks me, but this one was soft and juicy, not at all rubbery or slimy. Another food I much rather eat than think about was actually my favorite part of this dish: chunks of morcilla, a sausage made from cooked blood. It was rich and flavorful, and I’m going to forget what it’s made out of and just remember how delicious it was. We could’ve easily put away another savory dish each, but decided to save the remaining space in our bellies for dessert. I went with the torta de chocolate which was far from just a slice of chocolate cake. 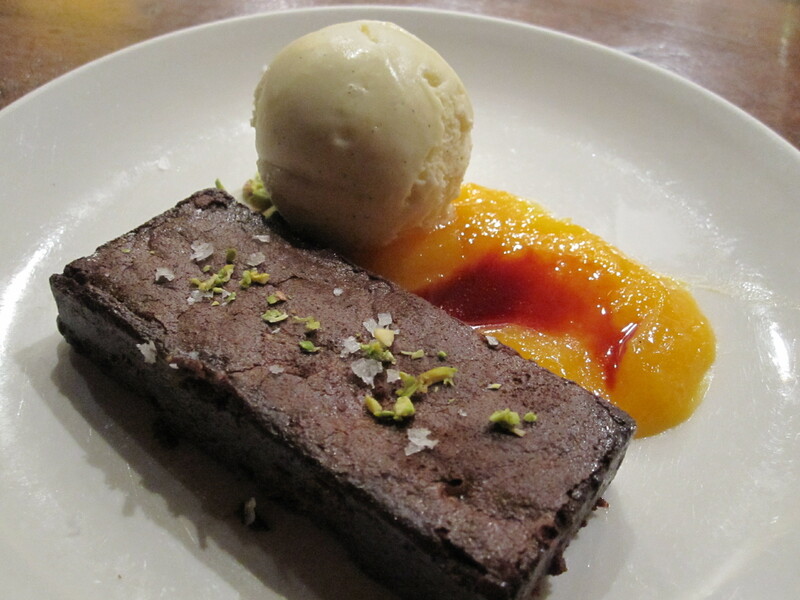 The brownie like chunk of fudgy cake came paired with a thick apricot marmalade and a scoop of vanilla ice cream. On top of the cake were crushed pistachios and flakes of coarse rock salt. Each spoonful, which I made sure had a little bit of everything, was a lesson in the perfection of opposites: warm and cool, creamy and chewy, sweet and subtly salty. The other desert we shared was just as good, but in a completely different way. The pudìn de naranja was a delicious mound of bread pudding with a perfectly seared caramelized crust and paired with a scoop of caramel ice cream and a wine-colored, poached pear. 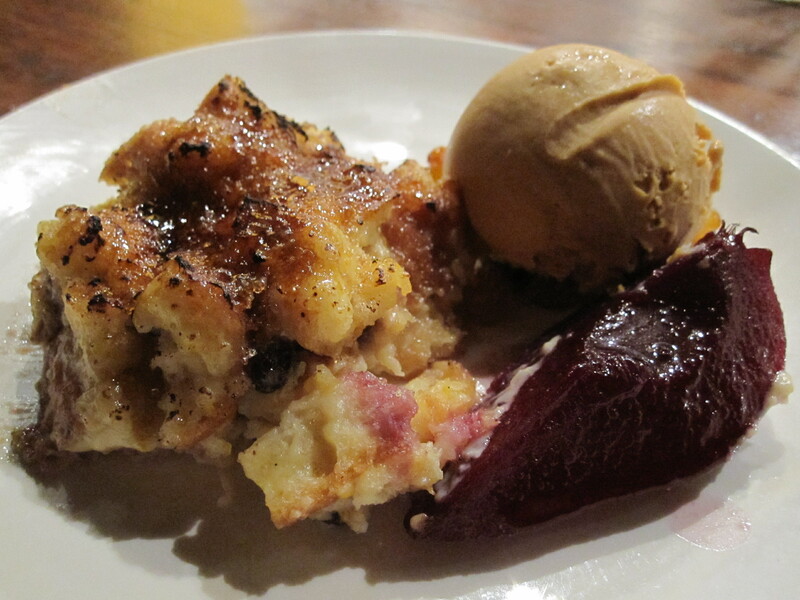 The bread pudding was creamy and simple, with a homey taste that truly gave meaning to the phrase comfort food. My mom’s bread pudding, while not terrible, tends to be on the gelatinous side but this one was warm and smooth and perfectly completed by the sweet coolness of the caramel ice cream. A really great meal always makes me want to travel, and this perfect dinner left me daydreaming about a trip to Spain and a table covered by an array of small plates and big round glasses filled with red wine. 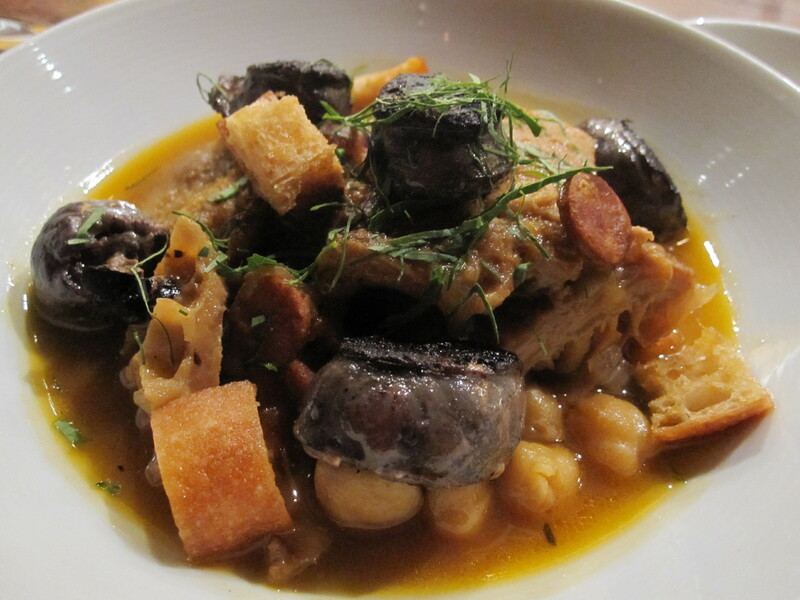 This entry was posted in Dinner and tagged Gramercy, Mario Batali, tapas. Bookmark the permalink.